The Yash Raj - SRK combo is back. Chak De India marks the return of Shah Rukh Khan with Yash Raj Films. Yup, so go for it! Not to mention the return of the King. Chak De India is an out-n-out sports based film. The film is to remind India of its national sport. The story revolves around the coach Kabir Khan's struggle to take the Indian Women's National Hockey to the top league. Ring in sixty years of Independence with this film and I have no doubts that you will walk out saying…chak de India! While we continue to go into ecstasy over cricket we hardly seem to realize that hockey is the true-blue Indian game. 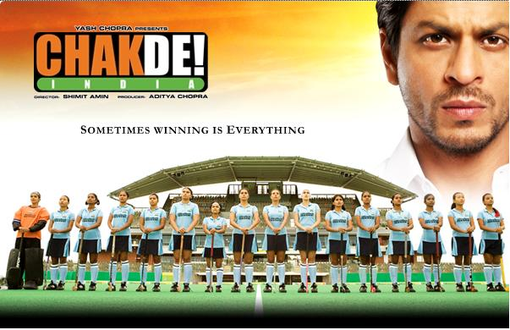 Chak De India aims at giving the dying game the respect it deserves. Go and watch with your entire family. The production revolution that has swept Bollywood in recent years has included the music as well.